Sounds good, right? Antimicrobials are miracle drugs that keep us healthy, fight off nasty bugs, and give everyone a free puppy, so what’s the problem? In short, we’ve gone overboard with the antimicrobials, and the microbes have figured out how to fight back. The indiscriminate use of antimicrobials gives microbes more and more opportunities to develop resistance. Farmers regularly add antibiotics to animal feed in order to promote animal growth; half of the antibiotics imported into Australia go into animal feed, and animals in the US receive more than four times the amount of antibiotics as humans. Doctors prescribe (and parents often demand) antibiotics for common colds and ear infections in children, even though antibiotics have no effect on viruses. In many places, people can buy antimicrobials over the counter without having to consult a health care professional. All of these situations allow for the emergence of antimicrobial resistance. The idea of antimicrobial resistance itself isn’t new. When Fleming won the Nobel Prize in Physiology or Medicine in 1945, he used his acceptance speech to warn his audience about the ease with which microbes could develop resistance to penicillin. What has changed in recent year is the scale of the problem. Late last month, Lancet reported about a new strain of pneumonia that has appeared in China—and none of the pneumonia drugs in China can treat it. A woman in Nevada died of a bacterial infection that was resistant to all 26 antibiotics available in the United States. The World Health Organization is reporting that an increasing number of countries are reporting strains of drug-resistant gonorrhea. The CDC has identified three urgent drug-resistant threats, including Clostridium difficile or C. diff. That’s the same illness that nearly killed comedian Tig Notaro a few years ago. At the same time, no new class of antibiotics has come on the market for more than a quarter-century. Teixobactin is the first new antibiotic to be discovered in nearly 30 years, but it won’t be available commercially for another five years. As a result, we have an increasing number of drug-resistant microbes and a decreasing number of tools to fight back. The failure to address antimicrobial resistance would be huge. Research by the RAND Corporation finds that AMR could cause the world’s population in 2050 to be decreased by between 11 and 444 million. The cumulative cost to the world’s economy could range between $2.1 and $124.5 trillion—and yes, that’s trillion with a T. We’re essentially in a place where the rise of AMR threatens to wipe out many of the health advances we have made globally since Fleming got his Nobel Prize. That’s where international politics enter the picture. Stopping AMR requires collective action; all of the countries need to work together on this. What’s more, addressing AMR means addressing both human and animal health and working with food producers. It can be hard enough to get countries to work together in a single area; bringing states together to deal with interlocking issue areas could be even more challenging. All hope is not lost, though. One year ago, the United Nations held its first High-Level Meeting on Antimicrobial Resistance. At the conclusion of the meeting, the assembled leaders pledged their cooperation to tackle the issue by strengthening regulations, encouraging research on new antimicrobials, and promoting public education about AMR. Holding this meeting put the issue of AMR on the international agenda and brought unprecedented attention to it. The World Health Organization also passed a resolution requiring the Director-General to provide updates every two years on his efforts to combat AMR, and the UN Secretary-General has been tasked with providing a similar report to the General Assembly for consideration during its 2018-2019 session. Resolutions by themselves don’t fix the problem, but they do signal the international community’s recognition of the importance of addressing AMR before the problem gets any worse. 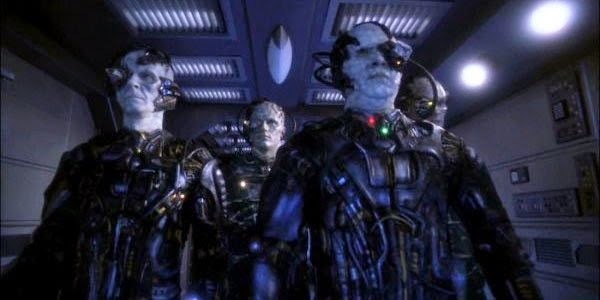 The Borg are super scary (they even assimilated Picard! ), but Starfleet has proven itself wily enough to keep the Borg at bay. That’s the sort of political will that we will need in order to address antimicrobial resistance. It won’t be easy politically or scientifically, but it’s absolutely necessary.